* First D.I.G. Instructor to reach Artist Level (5000 lessons taught under Guild auspices), Co-Director Level (10,000 lessons taught), and Master Level ( 20,000 lessons taught. 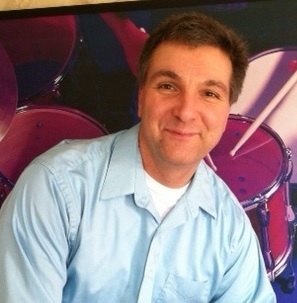 * Teaching articles for Modern Drummer Publications. * Mentored upcoming D.I.G. instructors. * Awards / endorsements with Aquarian Accessories, Meinl Cymbals, and Vic Firth, Inc.
* Recent appearance on the Fox 6 morning show "Real Milwaukee"- giving roving reporter Chip Brewster a drum set lesson! * First Chair / section leader within their school band program. * Scoring top awards at District and State Solo/ Ensemble contests. * Performing with their Church. * Studying percussion in college. * Teaching and/or performing professionally. * Still playing - YEARS/DECADES after receiving instruction! * Drum Kit: professional grade, scaled down for the smaller player and smaller studio. * Pitched Percussion: marimba, xylophone, vibraphone, bell kit, and even timpani . * Non-Pitched Percussion: complete battery - s.d., b.d., quads, field cymbals. * Auxiliary Percussion: tambourines, triangles, shakers, blocks, etc. * Latin Percussion: congas, bongos, claves, bells, scrapers, etc. When Bob’s NOT teaching, he enjoys spending time with his family and being at home. He’s been married to his wife Jenny for over 20 years and together they have two special boys: Charlie (9) and Andy (7). Together, they are active volunteering with their Church- Our Savior’s Lutheran, Oconomowoc- co-teaching Sunday school and performing with the Praise Band.